Enbland Enfuse is an easy to use tool for editing your panoramic images. This tool will help you edit your images by blending away the seams in a panoramic image mosaic by using multi resolution spline. How does it work? It merges different exposures of the same scene in order to create a photo that is practically identical to a tone mapped image. 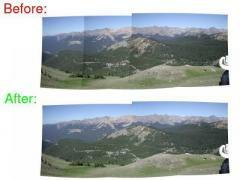 Enblend is combining images that overlap into a single large image and leaves no trace of seams.